Vicky Gill - 2014 European Long course Bronze medallist, Ironman UK 4th and Ironman UK 70.3 5th; Outlaw winner and course record holder 2013. Blake Pond - RTTC top 10 time triallist, multiple course record holder, 18:33 10-mile and 47:56 for 25-miles, 2014 PBs. Alan Ingarfield - Former UK Ironman-distance record holder . Multiple Ironman Hawaii qualifiers and finishers: Aled Smith, Jon Hall, Paul Thomas, Peter Harding, Dave Ambler plus many other athletes. I was voted the inaugural 220 Magazine Coach of the Year in 2004 and was Runner Up in 2007 and 3rd in 2010. I am also a British Triathlon qualified coach. 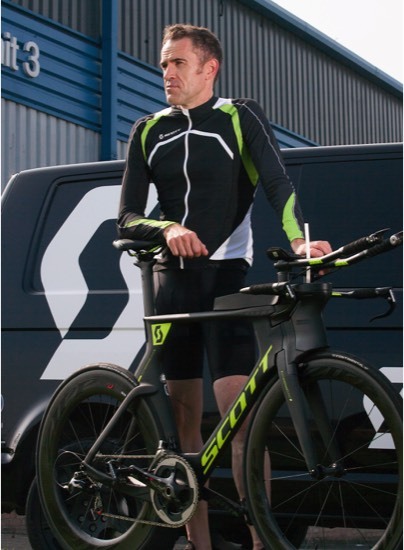 I am an ambassador for a range of top companies including Scott Sports, Science in Sport, Rotor UK, Nopinz, Forth Edge, Pedal Cover, Continental, Human Charger and Trainsmart. I ran cross country for my school (1977-1983) then moved into road running with 10k’s and half marathons in 1984-1986. I started triathlon training in 1986 and compete in my first event in 1987 (The Bath Triathlon, 19th) and have since done over 200 triathlons, duathlons and extreme events worldwide - Including the Hawaii Ironman and Escape From Alcatraz Triathlon. Why does my training and racing help other athletes? I am not a one trick pony or a theoretical coach. it takes to maximise performance.I am not a world champ. I don't pretend to be a pro.I just make people faster and don't want to stop going fast myself.I don't want to, or believe that you need to do, 20 Ironmans, 20 hours a week or below 20 minutes for a 10-miles to help athletes get leaner, faster and better able to train themselves to reach their maximum potential.That's it. No secrets just two decades of experience, long hours, thousands of pages or reading, hours in the lab, time in the wind tunnel, lots of experimentation and a desire to be constantly learning. How does experience get passed on to athletes? By using a host of media I can help lots of athletes despite not actually meeting face to face or directly coaching them. Instead Monthly magazine articles get out to the masses, an iTunes podcast goes Worldwide and of course a book or two in libraries and across the Internet helps too. There are training camps, presentations and 1-2-1 coaching days which help athletes on a face-to-face personal level. These are great but there’s only so much time to do everything. Signed-up remote-coaching clients receive personalised plan, regular calls to the office to help make tweaks to habits and equipment. Combined with smart use of e-mails, website and various Mac technologies it means there are few coaches using so much innovative technology. What academic work helps me more than just an athlete? I chose to study sport at degree level under such great Tutors such as Peter Keen and Ian Maynard. I continue to be involved with researchers at various universities, to subscribe to journals, get asked to contribute to product development and to search for the most contemporary findings on optimal training, nutrition and equipment.